Naval warfare came to Maine during the river rafting battle of the summer of 1959 Down Back on the Sebec River in Derby, Maine. The old swimming hole was a favorite spot for whiling away long summer days with swimming, fishing, and rafting. We constructed first class log rafts which served many purposes, including war games on one occasion. Our rafts were made from a half dozen fallen cedar trees about a foot in diameter that were chopped to 10-12 foot lengths, and then covered with scrap lumber nailed to the deck. At 6 x 12 feet, these floating platforms easily held 2-3 boys who could quickly navigate upstream pushing poles against the river bed from each side of the raft. The cedar logs were spread with small gaps in between for streamlined speed and navigation. The river battle began after picking two sides with a crew of 3 each, and then collecting soft clay from the bottom of the spring creek on the opposite shore across from the old swimming hole. The clay could be rolled in small balls for ammunition, and dried to a light grey when used for decorative war paint. The battle of 1959 was fought fully clothed even though the rule Down Back was no girls allowed, so swimming trunks were optional. Once each raft was loaded with piles of wet clay, the opposing team took a position near the swimming hole side of the river, and began pelting us with small balls of clay. Our crew formed a strategy as the first mate fired back and two of us poled upstream out of range. Our initial plan was to mount a fast attack using the current for added speed, and then storm past the enemy while all three of us tossed clay balls. We changed tactics and went with Plan B. 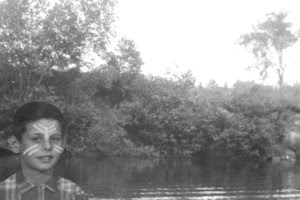 Crossing to the same shoreline upstream and out of sight, the junior crew member was put ashore for a surprise land attack by slipping through the woods, and hitting ’em from behind. Our spy lacked training which became evident from the thrashing he made instead of sneaking quietly into position. He was quickly spotted, and war whoops broke out as a stampede of 3 boys chased him back upstream. Timing was everything, and as the commotion drew near, my crewmate and I were pressed into action to avoid being overrun and losing the game. In a panic, we shoved off and were about 10 feet out as our teammate arrived with the enemy close behind. Despite his pleas to let him aboard, we kept going as he belted out childhood curses like “sons o’ buckwheat”, “baroids”, and a few others we had invented over the years. He was immediately captured and became the first Down Back prisoner of war. It didn’t last long. Under interrogation that rascal broke and joined the enemy forces, letting out all our secrets and tactics. Needless to say, we lost that battle facing four against us two, and eventually surrendered. In the end, the six young warriors were a friendly group of one, and headed up the path towards home with an occasional protest to the traitor… “baroid?”.